Dubai, UAE, November 14, 2016: With grocery shopping making deeper inroads into e-commerce globally, SOUQ.com, the largest retail and online marketplace platform in the region, is pleased to announce the launch of ‘SOUQ Superstore’ on its platform. SOUQ Superstore, an online hypermarket, is set to make monthly grocery shopping easier by providing household items at the most competitive pricing - helping consumers save money as well as eliminating the pain point of carrying heavy load of grocery purchases from supermarkets. SOUQ Superstore offers a huge assortment of products within six sub-categories; Food & Grocery, Health & Beauty, Household Needs, Pet care, Nutrition & Supplement and Baby Care & Food. In addition, there will also be curated stores within the ‘SOUQ Superstore’ including an organic food corner, chocolate shop and ‘food of the world’, available for delivery to all customers across the UAE, Egypt and KSA. This exciting new launch compliments SOUQ.com’s recent investment in InstaShop- as part of its drive to provide a world-class online shopping experience to customers. While InstaShop allows users to access their nearby grocery store directly through their mobile app with delivery straight to their door in no time, SOUQ Superstore is well suited for consumers looking to stock-up on household items ensuring they never run out of essentials. SOUQ Superstore will feature the largest range of products from the popular global FMCG brands such as P&G, Nestle, PepsiCo, Unilever, Henkel, Reckitt Benckiser, Mars, L'Oréal, Johnson & Johnson, Nivea and many more. 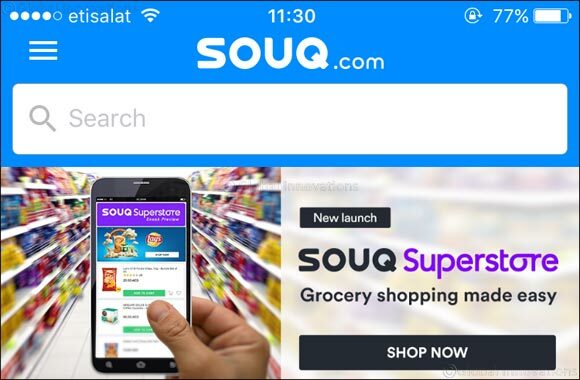 SOUQ.com launches SOUQ Superstore at a time of enormous global growth in online grocery shopping with up to 34% of online shoppers expected to buy groceries online this year versus 21% in 2015, according to recent Morgan Stanley Research. By adding this crucial category to their web-store offering, SOUQ.com has taken a huge step closer towards completing the purchase cart of a consumer on SOUQ.com and becoming a one stop shop for the region’s online shoppers. Tina Chikhani Nader, Shopper & Customer Marketing Director-Gulf, Unilever explains, “E-commerce for FMCG products is poised for a period of growth. Our objective is to make sure that Unilever do not miss out on that growth opportunities. We want to be where the consumer is going, and will keep a keen eye on how this area develops in the near future”. Michelle Hirst, Strategy and PMO Lead - Gulf at Mars adds, “At Mars we realise that today’s consumers are looking for convenience and special offers. We are really excited to be partnering with SOUQ.com, bringing our chocolate and pet food products directly to the doors of our consumers in a fast and effective way”.